This option is for this exact invitation customized with your information. This option is for a PRINT IT YOURSELF invitation, but with text additions, format changes, photo additions, or color changes. If you need more lines of text than what is pictured on the invitation, you need to purchase a this option. You will receive an initial proof of your invitation sent via email to the address listed on your Etsy Account. Once you are happy with your order, you will receive a high resolution 5"x7" JPEG, as well as a letter size for printing two 5"x7"invites on an 8.5" x11" sheet of card stock. You can print them yourself or have them printed professionally. First you will be emailed a proof of your invitation to the email address listed on your Etsy Account. Upon approval, you will be mailed printed invitations to the physical address listed in your order. I print front and back on 120# card stock and include white unlined envelopes. If you would like lined envelopes, please purchase the quantity you would like + Lined. Colored envelopes are available for a small fee. This option is for a PRINTED invitations, but with text additions, format changes, photo additions, or color changes. If you need more lines of text than what is pictured on the invitation, you need to purchase a this option. 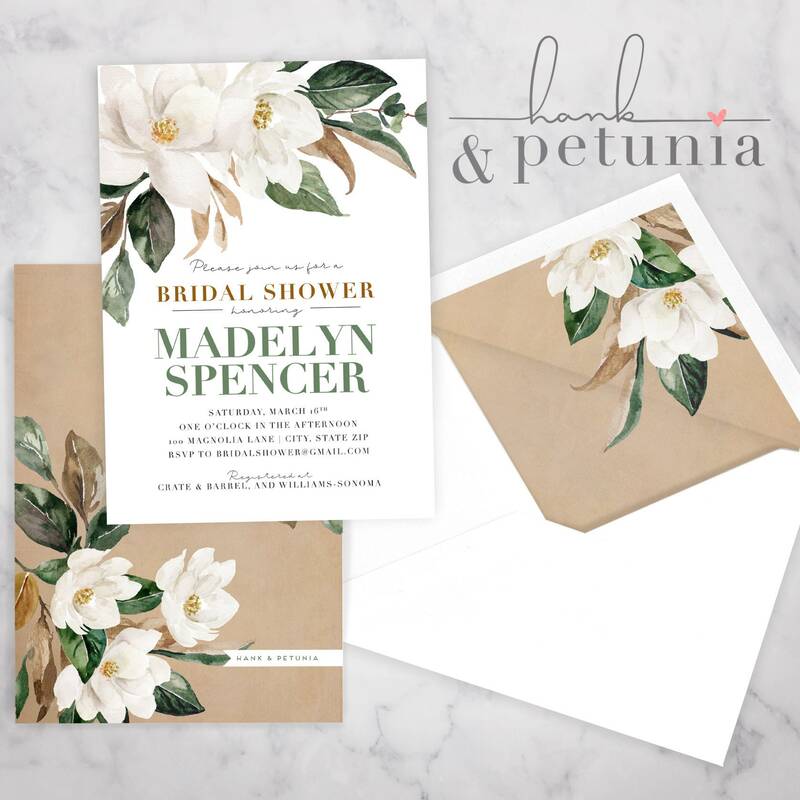 This option includes printed invitations, as well as already lined envelopes. 1. Choose one of the options during checkout. 2. Please include all of your party information in the 'NOTES' section at checkout. (Name, Date, Time, Address, RSVP, Gift Registry, Hosted By, etc.) If you have a photo invitation, please send your photo to hankandpetunia [!at] gmail.com. 3. Your proof will be sent within 2-3 business days. (Rush Orders are available upon request.) Once you receive your proof, please review and reply with any changes. We will work together until you are completely satisfied with your order. I will email a proof to the email address listed on your Etsy account within 2-3 business days after the date of purchase. Please allow up to 24 business hours for revisions or final printable. Any corrections sent on Friday may not be made until the following Monday. After approval, printed orders will be shipped within 1-2 business days (M-F 9 am-5 pm MST. We are CLOSED Weekends and Holidays). Because of the time sensitive material being shipped, I ship 2-3 day Priority Shipping. 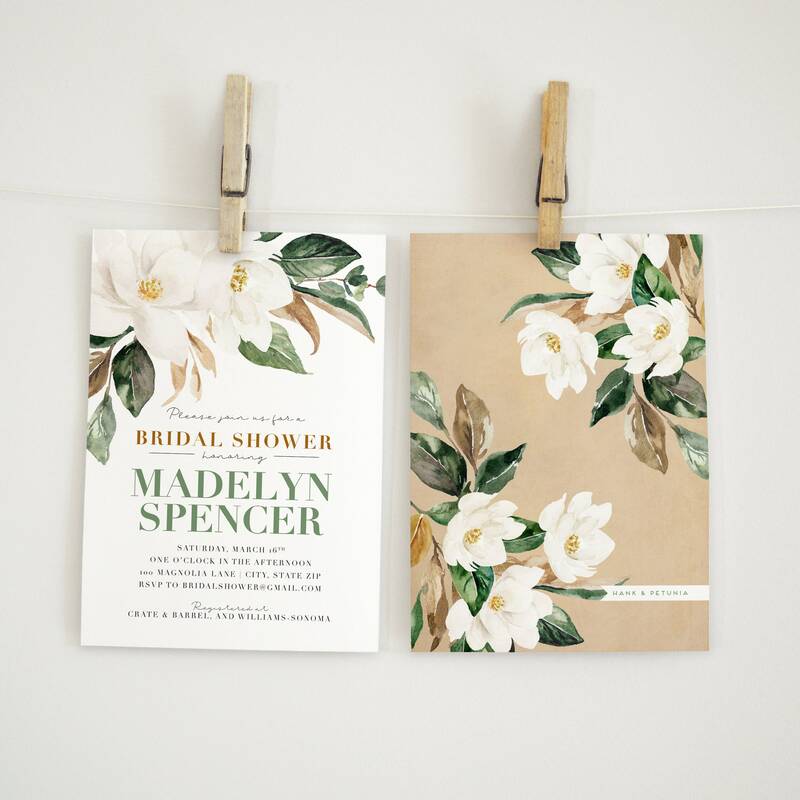 **Shipping is already included in the price of printed invitations. Current turnaround time is 3 business after the date of purchase for a proof. I don't work weekends, so orders that come in on Wednesdays don't get delivered until Monday's, and so on. Any option with "Custom" in the description is for added lines of text, color changes, font changes, format changes, etc.